Skydive Spaceland’s Florida location is one of the longest-running skydiving centers in the state; Airglades Airport has hosted skydiving for more than 29 years with one of the best safety records in the industry. We are surrounded by 2 square miles of airport and endless acres of sugar cane fields, so landing obstacles are few and far between. Lake Okeechobee, the United States’ second largest freshwater lake, is located 4 miles north of our drop zone and presents a gorgeous scenic backdrop for our South Florida skydiving friends. Friends and family are encouraged to come and watch skydivers as they board the aircraft, freefall from up to 13,500 feet, and land in our spectator viewing area. We are within easy driving distance from the Palm Beaches, Fort Lauderdale, Miami, Port Charlotte, Fort Myers, Naples and surrounding areas. 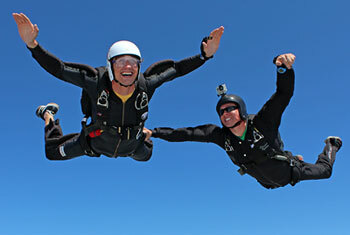 If you are looking to freefall skydive for the first time (tandem skydiving) in South Florida, this is the place! Give us a couple of hours out of your day and our staff are ready to give you, your family and your friends the experience of a lifetime whether you’re looking to fly by yourself, bring a couple of friends, or throw down a big skydiving party or corporate retreat/team-building event. Our staff and aircraft can handle all of your needs whether you’re skydiving by yourself or bringing a group. 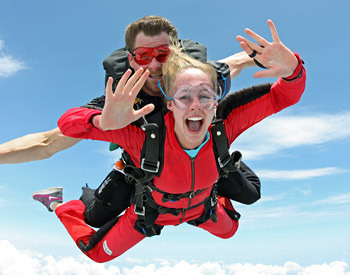 Have you seen our skydiving discounts, and did you know you can skydive for free? Our exclusive Skydiver Training Program offers the best training available to get your skydiving license in a short amount of time. This comprehensive program involves hands-on training from some of the best instructors in the business and graduates its students at a much higher skill and retention level than other programs. We are the only operation in the state of Florida that offers STP training for its students, and here you can get your skydiving license in as little as a week! Sunset hybrid skydive over Skydive Spaceland-Florida. 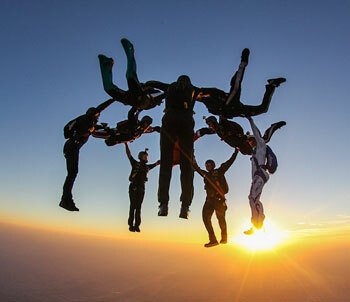 Check out the Everglades Boogie skydiving video! Spectators are always welcome at Skydive Spaceland! At other Florida skydiving operations, skydivers might be required to land off the airport property and shuttle back, leaving spectators wondering where their friends went. Here at Skydive Spaceland, skydivers take off and land right here at Airglades where you have a great view of the action! We also welcome all spectators to mingle with the skydivers and watch the professionally edited videos of the day’s tandem customers in our large, open hangar. It is free to park here and watch skydivers day in, day out if you like. And don’t forget our full-service Pro Shop, which provides everything from skydiving souvenirs to complete sets of custom gear.